For three decades John Duncan (US, 1953) has been exploring the psycho-physical limits of the individual, in sound, performances and installations. He sees his work as a kind of existential research, for himself and the audience. During the 1970s he caused a stir in Los Angeles with a series of radical physical performances, before he started to apply himself to the exploration of short wave radio and field recordings, in collaboration with such people as Paul McCarthy and Tom Recchion. After stays in Tokyo and Amsterdam, where he experimented with pirate stations, among other things, he moved to Italy, where he still resides. He has worked with Carl Michael von Hausswolff, Francisco López, Giuliana Stefani and members of Throbbing Gristle and Pan Sonic, and has participated in countless exhibitions and festivals worldwide. The Swedish artist and curator Carl Michael von Hausswolff (SE, 1956) is particularly fascinated by twilight areas, both in the everyday environment and in the cultural domain. Since the end of the 1970s he has made sound studies, particularly with a tape recorder, but in recent sound and installation work he has focused mainly on the exploration of physical realities on the verge of human perception. He makes use of wide-ranging electronic media to explore and manipulate streams of information, energy fields, visual and acoustic phenomena. In the visual art world he has become known through his participation in exhibitions such as the 5th Istanbul Biennial, Documenta X, Kassel, and the 2nd Johannesburg Biennial (all 1997). In 2001 he was co-curator of the Nordic Pavilion on the Venice Biennale. Von Hausswolff is also the co- founder of the virtual nation ‘the Kingdom of Elgaland-Vargaland’. Since he experimented for the first time with tape recorders and synthesizers during the mid 1960s, Asmus Tietchens (DE, 1947) has left his mark on contemporary music, both in Germany and beyond. His influence is best felt on the industrial music movement, but he steers clear of any well-defined genre or philosophy. His countless releases, showing affinities with musique concrète, serialism, minimalism and krautrock, are above all intuitive and personal explorations of the studio as an instrument, of a specific musical notion, or collaboration. 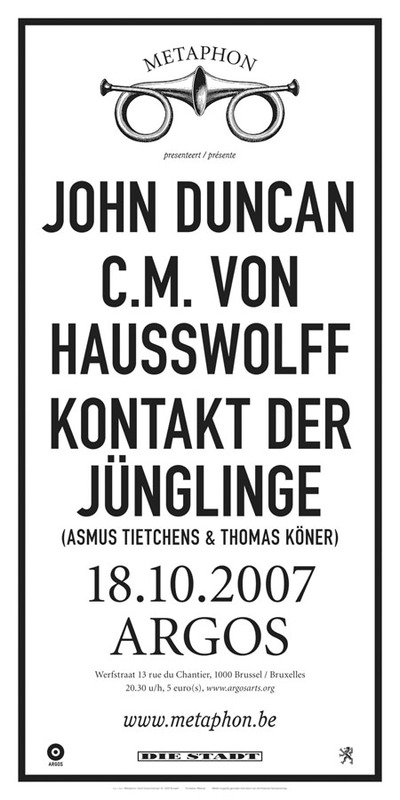 For a number of years now he has worked with fellow-countryman Thomas Köner (DE, 1965) on the project ‘Kontakt der Jünglinge’. Before Köner worked with filmmaker Jürgen Reble and with the duo Porter Ricks, causing a stir in the European techno landscape. Köner is particularly interested in the exploration of ‘sound color’, an idea which he recently carried further into the visual as well. His audiovisual work has received awards at Transmediale, Ars Electronica and the International Film festival in Rotterdam, among others. ‘Kontakt der Jünglinge’ is the confrontation of two wayward idioms resulting in unexpected sound patterns. Argos, Werfstraat 13 rue du Chantier, 1000 Brussels. With new die Stadt release exclusively produced for this event.